As the story snakes south through the United States along the Mississippi River, this movie builds up a bleak, mopey vibe that's difficult to engage with. 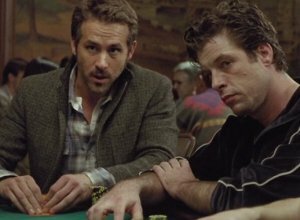 It's the story of two gambling addicts who think that the answer to all of their problems lies just around the next bend in the river, and it's sharply well written and directed, with astute performances from the lead actors. But it's also relentlessly grim and unsympathetic. 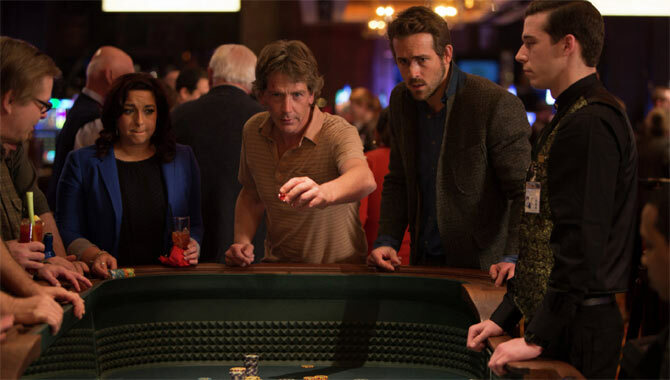 They start their journey in Iowa, where estate agent Gerry (Ben Mendelsohn) is at the end of his rope when he meets cocky gambler Curtis (Ryan Reynolds). There's a spark of recognition between them, as Gerry sees Curtis as himself 10 years younger, thinking maybe he can kickstart his life again. So they hit the road together, heading for a high-stakes poker game in New Orleans. 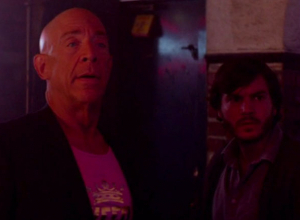 Along the way, they stop to visit Curtis' favourite prostitute (Sienna Miller) in St. Louis and Gerry's bitter ex-wife (Robin Weigert) in Little Rock. And in between, they visit Memphis to win some extra cash. But by the time they reach New Orleans, things are starting to look desperate again. Gerry's gambling addiction has gotten way out of hand. He's already lost everything in his quest for winning, so now he's thousands of dollars in debt to nearly everybody he knows. 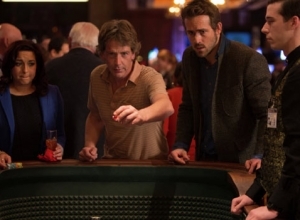 Continually losing doesn't stop him hitting the casino, but when he meets casual poker player Curtis - who unlike Gerry doesn't let a desire for the win take over his life - he forms an unlikely bond and finds that his luck is beginning to turn, but not necessarily in the money stakes. The pair team up in order to go for the big bucks on New Orleans' legendary poker scene, and Curtis soon finds that Gerry needs something big to pull him out of the rut that is his life. He's got to learn that there's more to life than winning, but is he willing to take a gamble on the advice of his mysterious new friend? Miles Teller and Analeigh Tipton are smart enough actors to make the most of this uneven romantic comedy, which never manages to disguise the standard formula, even with a gimmicky premise. So while the plot and characters are simplistic and artificial, at least there's some charisma on the screen to keep us entertained. There's also a spark of lively chemistry that makes the hokey romance somewhat amusing. It's set in New York, where Megan (Tipton) has moved in with her loved-up friends (Jessica Szohr and Scott Mescudi) to recover from a bad break-up. After a run-in with her ex (Josh Salatin), she goes online in a moment of desperation and then heads to Brooklyn for a one-night stand with Alec (Teller). But when she tries to sneak out in the morning, she finds that they're snowed-in, unable to leave the building. Super-defensive for no real reason, she creates a war-zone in the flat, and they eventually agree to be ruthlessly honest with each other. If they're going to be trapped together, they might as well learn something useful. There's never a question of where this is heading, although the script makes Megan such an angry shrew that we really don't like her at all for much of the film. She only calms down when Alec produces some weed (a misogynistic plot point), and as they finally begin to communicate Tipton and Teller are able to inject an enjoyable mixture of intelligence and wit into their rambling conversation. This makes them feel more realistic, and lets the film make some sharp observations about the nature of courtship in the world of dating apps. Yes, looking for a partner online is difficult even when "the bar is set so very low". The sitcom becomes the first cancellation of the fall season so far. ABC have plugged the plug on romantic comedy ‘Manhattan Love Story’ after airing just four episodes. The sitcom starring Analeigh Tipton had seen ratings quickly declined since it made its debut on September 30th. The sitcom followed Dana Hopkins (Analeigh Tipton), a young woman from a small town who moves to New York to further her career and look for love. Dana then soon finds herself embarking on a relationship with serial dater Peter Cooper (Jake McDorman), with their journey as a couple explored in the series. Luc Besson gleefully combines two of his favourite movie elements - fit women and wildly insane action - in this raucous guilty pleasure. It's almost as if he's trying to make his own version of Inception, but this is one of those films that only pretends to be brainy and existential. It's actually a slick, silly, improbable action romp. And it's a lot of fun. The title refers both to the very first female and an American student (Scarlett Johansson) living in Taipei whose loser boyfriend (A Hijacking's Pilou Asbaek) ropes her into making a delivery to notoriously vicious crime boss Jang (Oldboy's Choi Min-sik). Grabbed by Jang's goons, she's forced to become a mule, with a kilo of experimental drugs implanted in her abdomen. When it bursts, the drug allows her to access much more than the 10 percent of the brain humans normally use. By the time she hits 20%, she can already control people and objects around her. And the percentage keeps climbing. So she heads to Paris to meet mental capacity expert Norman (Morgan Freeman) and figure out what to do. But Jang and his army of thugs are in hot pursuit, so she enlists a local cop (Syriana's Amr Waked) to help. Besson doesn't like to hang around, so the film takes off like a shot, only barely pausing for breath in its brisk 89-minute running time. On-screen captions keep us updated on Lucy's brain capacity, and it's great fun seeing every advancement she makes on her way to 100%. This allows Besson to indulge in deliriously enjoyable mind-bending action sequences that play out like he's a kid with a giant set of very cool toys. Outrageous car chases, giant explosions and random epic shootouts fill the screen as Lucy expands her mind, begins to bend reality around her and transcends the limits of numbers and letters. From 'Whiplash' to 'The Fantastic Four', we're looking forward to seeing more of Miles Teller. Miles Teller first gained our attention as hedonistic ladies man Sutter in the 2013 rom-com 'The Spectacular Now', before going on to another comedy love story 'That Awkward Moment' earlier this year. Now, Miles Teller is exploring a range of projects over the coming months. He was convincing as a rom-com fixture until he played the nasty piece of work Peter in 'Divergent', so now we're pretty sure his versatility renders him unpredictable. One look at his upcoming movie projects and you'd never think they were all starring the same guy. When Megan (Analeigh Tipton) is asked to move out of her by her best friend (Jessica Szohr) and her boyfriend (Scott Mescudi), she begins online dating by looking for a one night stand. The next morning, she awkwardly wakes up next to Alec (Miles Teller), and soon rejoices in the ephemeral nature of their relationship. But upon attempting to leave, Megan discovers that she has been snowed into Alec's apartment, causing the couple's one night stand to continue longer than it should have. As the two twenty-something New Yorkers are forced to get to know each other, in this quirky romantic comedy, they finally decide that they should perhaps try again, to see if they can successfully take on board their advice. Lucy was just a regular girl living in Taipei, Taiwan before she was brutally kidnapped by a gang while out partying. She wakes up after some hours in a strange room feeling groggy and is informed by a crime boss that she has had drugs implanted into her abdomen for transportation. She is held hostage and chained up, but during a particularly heated confrontation with one of her captors, she takes a blow to the stomach causing the parcel of drugs to leak into her system. As the drugs take hold of her, she starts to feel alert, agile and strongly tolerant of pain. She has the drugs removed from her stomach at the hospital but she has already absorbed enough that she can somewhere take in all information around her and remember it, as well as instantly change her appearance and move objects and people with mind control. With her brain already at the superhuman stage, Lucy starts to worry that she has no humanity left. BAFTA nominated Luc Besson ('The Fifth Element', 'The Transporter', 'Taken', 'District 13') has directed and written this thrilling sci-fi flick about the hypothetical limitlessness of the human mind. 'Lucy' will be released in the UK on August 22nd 2014. A young male zombie spends his days roaming the barren and devastated wasteland that is America with limited thoughts and actions, only able to remember that his name while he was human began with the letter 'R' and only yearning to eat the brains of the few remaining living humans just so he can connect and learn to feel alive again. It's a post-apocalyptic world where a huge proportion of the population have been infected by a plague turning them into forever wandering, blood thirsty, undead creatures; some still have a little human left inside them, while others (known as Boneys) are skeletal creatures devoted to eating anything and everything with a heartbeat. After 'R' and his dead associates are set upon by a gang of humans with guns, he finds himself feasting on the brain of a man and absorbing his memories and feelings. When he catches the eye of the man's girlfriend Julie, he is overcome with the bizarre feeling to protect her and takes her away to the abandoned airport to hide her. When the other zombies see them together, the emotions are set off throughout the lot of them and they and the survivors all find themselves banding together to fight the Boneys who still remain emotionless and highly dangerous. Directed and written by Jonathan Levine ('50/50', 'The Wackness'), 'Warm Bodies' is about a zombie nation being cured by the powerful thing that is love. It is based on the novel of the same name by Isaac Marion and is set to hit cinemas in the run up to Valentine's Day on February 8th 2013. 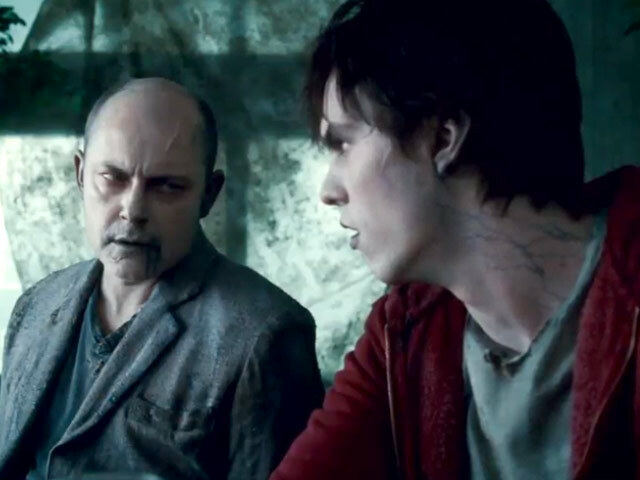 Starring: Nicholas Hoult, Teresa Palmer, Dave Franco, Analeigh Tipton, John Malkovich, Cory Hardrict & Rob Corddry. Funny, fizzy and packed with astute observations, this endearing film can't help but make us smile. It's perhaps overly mannered and obtuse, but anyone looking for originality in the cinema won't be able to resist it. Lily (Tipton) transfers to a rather pathetic New England university, where she's immediately adopted by the obsessive-compulsive Violet (Gerwig) who, with cohorts Rose and Heather (Echikunwoke and MacLemore), runs a centre for the rather large number of suicidal students. Lily starts dating two guys - charmer Charlie (Brody) and seducer Xavier (Becker) - just as Violet catches her dim-bulb boyfriend Frank (Metcalfe) snogging one of the depressed girls (Fitzgerald). And things start to get increasingly complicated for everyone.